the amount of people writing him off is laughable. He is still a kid and still look dangerous albiet not playing well, he need to be more consistent and as some said play it simpler when thing are not kicking in, but yes lets cash in on him !! A kid is benching a 25 year old 100 pl goal striker, so the kid needs to deliver as a united striker. Just wasn’t his night at all our there. Couldn’t control the ball, shots all over the place and pretty much stank up the place. Why they subbed Lukaku who was playing better in the 2nd half!? But worrying. Lacked composure tonight but i certainly wouldnt right him off. He has great pace and can dribble passed players with ease, just needs that killer instinct - like ole had. Not his night and not sure he is 100% fit. I have been there and I posted stating I think people are being a little harsh . No way was Young worse than Rashford. A very good player on his day, but tonight was not his night. Don't why he stayed on the pitch and Lukaku was taken off as he was better tonight. I think we would've been better with Martial, Lukaku & Mata coming on. I wouldnt confuse dribbling with sprinting past players, even welbeck could sprint past players. the problem we have with rashford is he lacks technique on the ball. He is very similar to lukaku in terms of what they can do on the ball and guess what? They both started today. If it wasn't for his determination and work ethic he really wouldn't be here today. His work ethic sort of blinds people a bit to the fact that Martial should be out there instead of him. Rashford is an okay player, he doesn't have anything that stands out in his game IMO. He's a decent crosser, I don't know why he takes any free kicks to be honest, and he still needs a lot of work on his finishing. His movement is massively overrated, and when he gets the ball he tends to lose it quickly under pressure. Martial, on the other hand, has a far better first touch, and is capable of unlocking a situation on his own with his dribbling. He'll lose the ball trying to make something happen, but far less likely from just being unable to hold up the ball under pressure than Marcus. The problem is he's very inconsistent as well, and he triggers the body language experts on here. Neither of them warrant the contract they're supposed to be getting, but I honestly wasn't shocked by Rashford's performance tonight, outside of a decent cross he was basically playing the way I see him play many times. Why is he taking the free kicks? They don't amount to nothing together with his long range shots that goes over the bar. Why he doesn't trust his teammates, keep the passing move going and then move inside the box like a normal striker. I feel like all our passing moves die when the ball reaches his feet. @Isd Strikers are meant to be selfish specially in a team who don't dominate the ball, not entirely brainless too but he is surely not in form. I don't even remember his last good game. Feels like ages ago. He's a one trick pony. He's all about kick and run. When that doesn't work he's in trouble as he's technically not good enough. IMHO he's genuinely mid table material, there's no way he's getting into a City, Liverpool, Barca, RM, PSG, Spurs, Juve or Bayern team so why do Utd persist with him. I know he's young but I simply don't get the hype surrounding him. How does everyone see his later career going. If he's still at united of course. I ask because he relies too much on speed and little else and a major injury and age tend to slow players a bit. So, for now he gets a pass on the inconsistency owing to still being on a learning phase,but what about later, could we be creating a monster for when he's ~29urs that will only come back to cause trouble for us when he's too big without having performances to match? Needs to practice shooting again. Ridiculous really. Feels like some are happy with another season when we scrap for 4th spot. He was really good for a while and even had me questioning my previous opinion of him never reaching world class heights. He's been gash lately though. He was completely abysmal. The hype surrounding him greatly exceeds his talent. Exactly the same with me. I never really saw the hype everyone did but he began to change my mind, unfortunately I think I’m back at where I was before. Don’t see him ever being that great a player. If he doesn't learn the importance of putting in a shift I am afraid that's how far impact he can have, with only slight improvement. Nothing more. You can criticize him for many things but putting in a shift is not one of them. Always works his socks off and he is the first line of defense pressing their defenders. Ole said he had an injury concern and was unwell. Not sure why we're playing him if he's not 100%. Cashing in this summer would make plenty of sense - would likely be able to sign Icardi or Jovic with the proceeds. Welbeck was a far bigger tactical asset at the same age, and Greenwood is going to eclipse him very soon. Rashford and Lingard belong at mid-table clubs - anybody who says otherwise is simply clinging to the romantic notion of having academy lads in the team. While I agree with the second sentence I don't think the cost to return on the strikers in your first sentence are that great. Icardi is toxic and a poacher and Jovic is also just a poacher. I'm starting to wonder if we're saying this stuff to take some heat off him. They've been saying he's injured for weeks now but he doesn't appear to be suffering physically. It's completely his decision making that's the issue. If he had an injured ankle still then why is he trying to hit rockets from all over the place? He's surely not 100% and he needs some breather. He tends to do this when he is not 100% and is tired. He's just had 2 weeks off. He is being rushed back as games come thick and fast. A fully fit rashford makes much better decisions and plays much better. It's not an excuse, its just the way it is. I thought he was our most dangerous player last night. Especially in the first half he had a good game. The second half was not good. He needs to find consistency. Hope he bangs in another inury time winner next week. We watched a different match then. 2nd half was not good thats true, but first half was good. Dalot should have scored after that cross for example. Dude is only 21..I think he’ll figure it out. 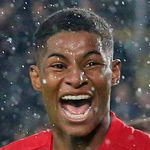 Ole joined us in mid Dec and Rashford has only been good for 2 months up until the early Feb.
One of the things I don't get is why we persist with him at centre forward. i get that he is good at running in behind, great pace, and he can finish, well.. sometimes. But the thing sticks out is, when there's an attack on, not a counter attack with a whole half to run into, but a normal attack with defence behind the ball, he has no awareness of what's around him at all. He stands there flat footed, staring at the ball. He needs to learn the meaning of the term 'come alive in the box' because he is offering nothing when those attacks are on. He's not creating space for another player, he's not putting himself in the best position to receive a pass, and if he does get it he's so flat footed he just loses it instantly. Lukaku might have an appalling first touch and not be great at holding the ball up but he is a better CF than Rashford and does at least have a predatory instinct and so why he got hooked before him last night, or was shunted out wide to accommodate him, is beyond me. He thinks he’s got it made. He is good, but there are facets in his game that are underdeveloped and he must improve: heading, finding the right pass to assist a teammate when fast thinking is required, how to use space, getting into good positions in the box, being ruthless on one vs one situations, and when to take a long distance shot vs finding a teammate. He needs to remain humble and some of those facets will improve, and some not so much. I remember when RM came in for CR7 the one thing they liked about him is that he had it all: he could shoot with both feet, he could head extremely well, and had good overall football awareness. Confidence is good for Rashford, but he also needs to realize there is a long way for him to go before he can become who he thinks he already is. This idea that Rashford "thinks he is too good" is absolute nonsense. Where do people get evidence for these things? All that has happened is he had illness, injuries, was rushed back and is out of form. His finishing needs to improve as does his decision making, but that will only happen when he gets consistent play as a striker. He also needs good wingers and more creativity behind him. As does Lukaku to be fair. The pros: Hes 21, hes one of our own. He sometimes scores good to great goals. He can run all day. The cons: Hes very inconsistant, He makes bad decisions a lot of the time. He cant take free kicks. Hes not what we need as main striker. This place will be sucking at his skin flute again once he bangs in a few goals. A lot of this forum is 'sucking on his skin flute' seemingly regardless of what he does. Whatever it is he thinks of himself, it hasn't seemed healthy for his development over the past few months.